Soak rice and dhal for one to two hours. Wash and drain the excess water. Grind along with red chillies, asafotida, salt to a coarse paste. Grease idli plate and put the above paste and steam cook for about ten minutes. Remove from the idli plate and cut it into small cubes. In a kadai put the oil and when it is hot add mustard. When it pops up add urad dhal and fry it turns light brown. Then add curry leaves and the cut cubes. 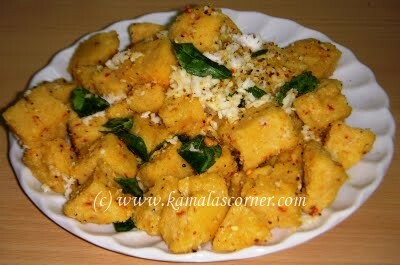 Sprinkle idli milagai podi and coconut gratings. Mix just for a second in a low flame and remove from stove. Thanks for the recipe Kamala. Does this need to ferment overnight like the idli batter? No. Not necessary to ferment. You can make it immediately on grinding like adai. In fact it tastes like adai only. I guess one should use parboiled rice? You can use any type of rice. I used raw rice.